While the world has been focused on oil, gold and various other natural resource commodities, water is the one thing we continue to take for granted. Looking beyond the fact that it covers 70 percent of the Earth, water is all around us; it's in the air we breathe and it's one of the primary components of the human body. Such an integral resource could be seen as a daunting topic to cover in the form of a documentary. However, Jennifer Baichwal and Edward Burtynsky took up the challenge and have presented an insightful look at humankind's uses and abuses of the natural element, by way of their film, Watermark. The two previously teamed-up for 2006's award-winning Manufactured Landscapes, which found Baichwal following Burtynsky as he travelled throughout China, photographing the country's physical transformation into an industrial workhorse, manufacturing much of the Western world's consumable goods. Baichwal translated Burtynsky's photographic eye into a stunning motion picture that gave viewers something to ponder. Watermark finds the duo working as co-directors, distancing the focus from Burtynsky's photography, instead taking viewers on an expedition of humanity and its relationship with water. Through a series of incredible high-definition images — a tremendous number of shots are aerial, giving dimensional context — Baichwal's tendencies to juxtapose themes mesh well with Burtynsky's eye for geometry and composition. 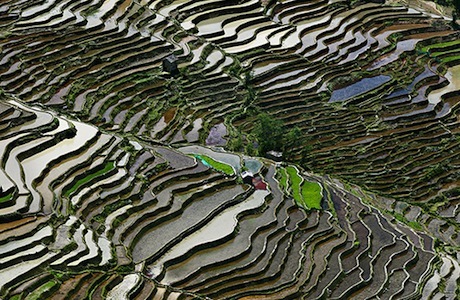 One such contrast depicts the construction of the massive Xiluodu dam and the rice paddies of China, an obvious nod to China's modernization, even while its rice growers adhere to centuries-old farming tactics. Another depicts the Hindu pilgrimage to the Ganges to wash away their sins, while tanned Californians on the other side of the world celebrate at a surfing competition. Still another highlights the tannery district of Dhaka, Bangladesh, which continues to pour its toxic waste directly into its waters, while a largely untouched watershed in Northern British Columba is explored. While the obvious underlying theme is one of ecological politicking, Watermark stops short of hammering viewers with a heavy-handed message. The images of the now bone-dry Colorado River delta are both devastating and breathtaking, while the impact of damming and water diversion is both shocking and something to behold. The highly expository Watermark provides deep insight into people whose lives are intrinsically affected by water, both industrially and spiritually. The end result is a film that's not only visually pleasing but also food for thought. Its contemplative approach will give viewers something to consider and, thankfully, leave it up to them to decide what the film's message should ultimately be.